The goal of the AeRoArms project is developing an aerial robotic system with multiple arms and advanced manipulation capabilities for application in industrial inspection and maintenance. The AEROARMS project poses complex mechatronics, control, telemanipulation perception and planning problems. 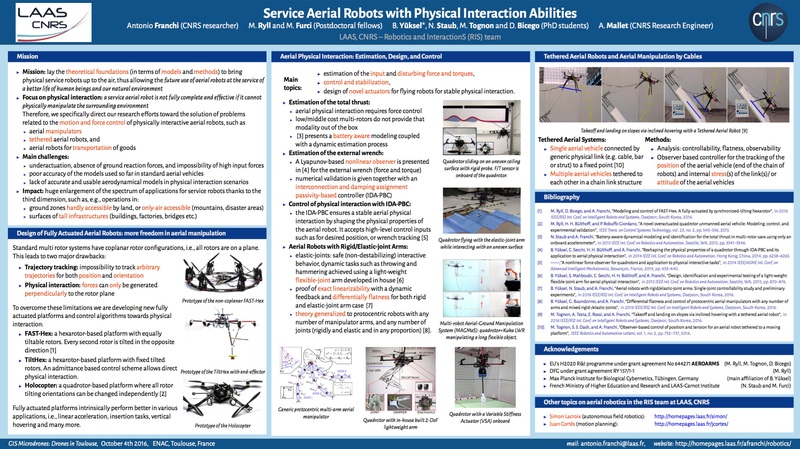 Particularly, new mechatronic designs and control methods are needed to implement the aerial robots with several arms for grabbing and flying operations. Advanced control strategies with force and vision feedback are also required for manipulation. Also new coordinated control strategies of the multiple arms and the aerial platforms are needed. Moreover, new perception methods, with ability to adapt to changing illumination conditions, are required for accurate local mapping and localization in denied GPS industrial environment, grabbing and manipulation, and integration of sensory data to help the operation of the crawler. On the other hand, planning is required to compute the required motions of the aerial robot for efficient and safe grabbing and manipulation taking into account the constraints imposed by the aerial robot and the environment, including motion planning for torque compensation, and for cooperation with the ground mobile robot. Moreover, reactive behaviors to increase safety, avoiding collisions with objects in the environment will be also implemented.